Creating a mobile website has never been easier. You can view and edit the mobile version of your website from the Mobirise Site Creator. We ensure that your site visitors always have a high-quality experience whether they are coming from a phone, tablet or computer. 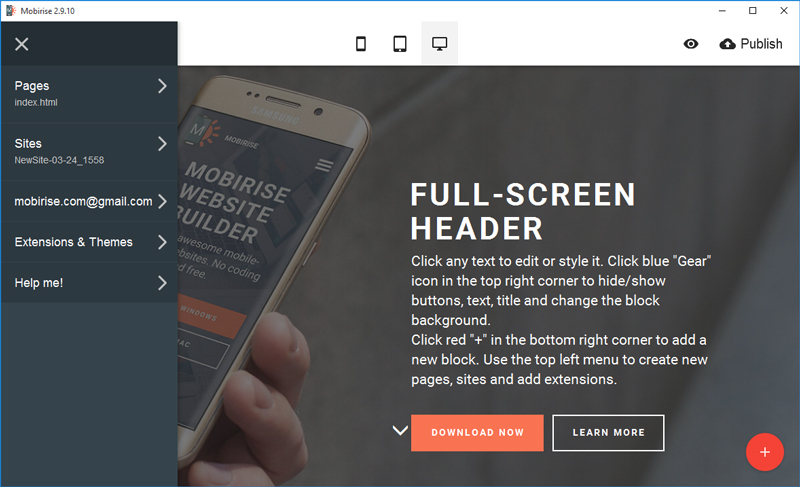 Mobirise puts powerful mobile website builder tools directly into your hands. Full mobile optimization and customization is simple with a visual editor that allows you to drag and drop elements into a mobile-specific display. See exactly how your website will appear for mobile visitors as you edit and preview your site on iPhone and Android. Create and manage a single site that works everywhere. Your Mobirise site is automatically optimized for mobile browsing and search engines. All changes automatically synchronize between desktop and mobile versions of your content as you remove, edit, or add elements to your mobile website. Select a high-resolution stock photo from a gallery of free background images or upload your own in order to further personalize your website design. Experiment with overlay options for additional customization with Mobirise's powerful background editor. Free Google Fonts - Mobirise includes a curated set of fonts from Google's font library that can be used without having to insert embed codes. Drag-and-Drop Management - Add and organize your images instantly. You can drag images directly from your desktop onto your browser window. Automatically Responsive Designs - All pages are completely responsive and work on any mobile device. Direct Editing - Edit content directly from your website with built-in editing overlays. A flat user interface is an increasingly popular design for websites and encourages customer conversion.